Dual Electronics XPE Series XPE2700. 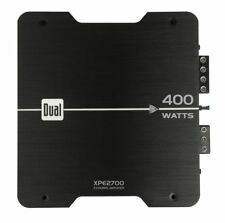 The DUAL XPE2700 TWO CHANNEL AMPLIFIER – your Dual Electronics High Performance Power MOSFET car amplifier has specific linear circuitry that improves sound quality and power output while reducing distortion and refining efficiency for unrivaled sound superiority. Trending at $44.98eBay determines this price through a machine learned model of the product's sale prices within the last 90 days. Dual Electronics XPE2700 400 Watts 2/1 Mono Channel Amplifier Full Range Amp new in original box. • THD (RMS): < 0.5 %. • Amplifier bridge mode to connect 2 amplifiers to one sub. • Damping factor: > 100. • Signal to Noise: > 80dB (THD < 0.5% @ Ω, 12V). • Speaker Impedance: 2Ω or 1Ω. • Frequency Response: 20Hz - 150Hz (0, -3dB). Dual DA8001 5200 Watt Peak/2500 Watt RMS Mono Class D Car Audio Amplifier. DUAL DA8001. Peak Power Output: 5200 Watts. RMS Power Output @ 1 Ohms: 2500 Watts x 1 Channel. RMS Power Output @ 2 Ohms: 1500 Watts x 1 Channel. DA8001 Monoblock Class D Amplifier. 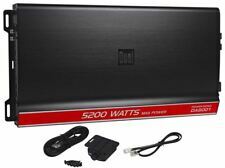 Dual DA8001 5200 Watt Peak/2500 Watt RMS. Peak Power Output: 5200 Watts. Mono Class D Car Audio Amplifier. Amplifier bridge mode to connect 2 amplifiers to one sub. Mono channel digital amplifier. Size:700 Watt | Style:Mono Channel. 700 Watts Peak Power, 150 Watts x 1 RMS power @ 4 Ohms, 350 Watts x 1 RMS power @ 2 Ohms. Variable low-pass crossover and variable bass boost. Product SKU: 78006 ID: da301l. Dual DA301L. 700W Peak (350W RMS) Ultra Compact Low Profile Series Series Class-D Digital Monoblock 2-Ohm Stable Amplifier (Made in Korea). Digital Low Profile Series Monoblock Class D Car Amplifier.